So, I’m chatting away with Miss Sam, of Weyandt’s affection, and discussing a possible X-mas party. There’s the traditional White Elephant party, but when your attendance reaches 100+, you’ve gotta bend the rules to make this work. Otherwise, you’ll be there till my Birthday (St. Patrick’s Day. I like Legos). In America, you can turn anything into a game by adding either “Strip” or “Drinking” to it. So, what would happen if there was a penalty for stealing? –Snoopykiss is suddenly in the Christmas mood. Turkey in a Bag, babye! I made a turkey in a paper bag that was so juicy that it de-winged itself upon removal. BOO-YAH! This was probably due to the uber-slow cooking oven I’ve got. And by uber-slow, I mean the 325 setting really means ~250. I also gave a Thanksgiving prayer, so unique that I got a round of applause (I think, even from the Aethist) after my Amen. You just had to have been there. Mad, mad props to that old black lady who I’ll probably never see again, but talked me into this whole mess. I was able to impress a bunch o’ people, including myself because of it. –Snoopykiss has mad turkey skillz! I was out at the Bone and dancing with Ann. (A particularly attractive and wonderfully great follow who I met at ALX this past weekend.) We were having one of “those dances”. I thought it was pretty good, but this random person came up afterwards and was ranting and raving about how great it was. And then earlier today, I was buying groceries for my “Orphan’s Thanksgiving” and was all prepared to go the bachelor route of buying a frozen pre-cooked turkey, I asked this old black lady what she thought of it. Long story short, I went from trying to get confirmation that I was getting a good turkey to getting talked into cooking my own turkey myself. 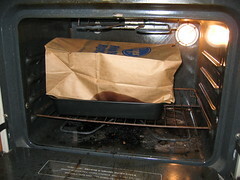 Using a paper bag. Crazy. –Snoopykiss has just become a fire hazard.